Ocean City is widely known on the East Coast of the United States as a frequent destination for vacationers in the area.During summer months over 350,000 vacationers will make the journey to the beaches of OCM each year. In 1952 the Chesapeake Bay Bridge was completed and Ocean City became easily accessible to people in the Baltimore-Washington region. Ocean City became one of the largest vacation areas of the East Coast. By the 1970s construction began for more than 10,000 condominiums with a glimpse of the ocean and pounding surf. Come enjoy Ocean City with your family and enjoy many activities such as miniature golf, go kart tracks, famous boardwalk, beautiful beaches, Carousel Indoor Ice Skating Rink, Live Wild West shows, Water Parks, Trimper Rides with100 rides, games & amusements for young & old and more. In season or off season there is so much to do. 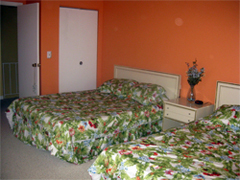 The vacation rentals for Raffles Condominiums in Ocean City Maryland are conveniently located in North Ocean City Maryland and available for rent at www.rentraffles.com. Starting at $125.00 per night and sleeping 6 comfortably, take advantage of a Great 2 level end-unit Townhouse overlooking the large in ground pool. Walking distance to Beach, Restaurants, Grocery Store, Shopping, and North side Park with jogging trails, and huge playground. Spacious one bedroom featuring two (2) Queen beds and a Queen sleeper sofa in living room. Sleeps 6 comfortably. Enjoy views of the Ocean & the Bay from the private balcony. Plenty of parking, Central A/C, Cable TV, Washer/Dryer in Unit, Fully Equipped Kitchen, Full Bath. Updated furniture and appliances, new Berber carpet. Very clean and meticulously maintained! Only a short drive to the famous Ocean City Boardwalk. See JULY 4th FIREWORKS, HOLIDAY WINTER FEST OF LIGHTS AND SUNDAES IN THE PARK FROM THE PRIVACY AND COMFORT OF YOUR OWN PRIVATE BALCONY.